Those who follow closely know I take the food for Wrestlemania really seriously. Well I take the food seriously, but make some dumb fun out of naming the dishes. 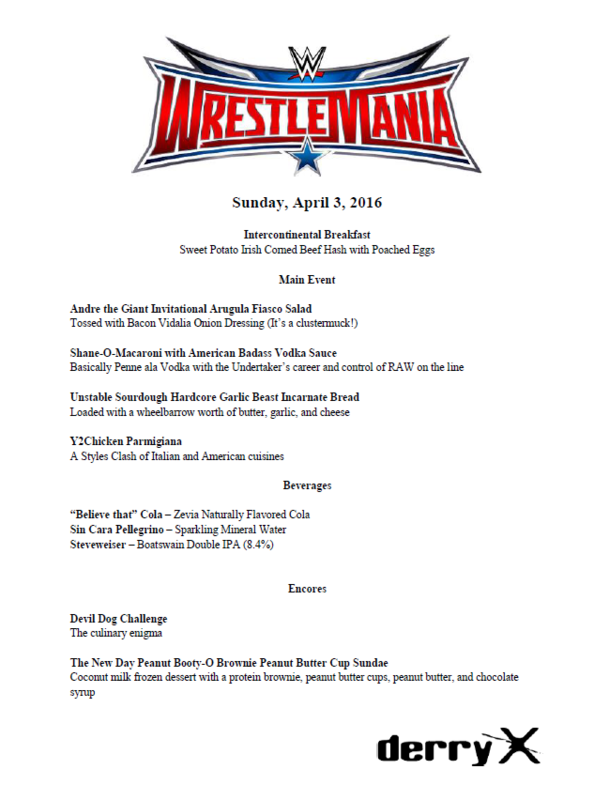 For Wrestlemania 30, my brother was in town, and I pulled out all the stops for a really elaborate menu. We were so full we didn’t even get to a lot of the snacks. Last year, I was lazy and called in a Pizza Hut Meat Lovers Pan Pizza. It’s probably the most calorie laden stuff that makes you feel like crap after eating it, but for some reason, it’s what I wanted. This year, it’s just Cassie and I, and I’m really in the mood for some Italian-American stuff. I’m also eating pretty healthy, for the most part. So I planned my menu around the Italian-American theme with some of my clean cooking techniques. I threw a few treats in there to make this a proper cheat meal. If you want to see how these turn out in real time, I’ll be posting live updates to Instagram. Update: The event has come and gone. Here are images from the food filled weekend!